In keeping with the house’s other Regency colors, the columns on the front porch were painted to resemble verdigris. It’s rare to find a mid-19th-century house that’s survived almost entirely intact for more than a century, but it’s even rarer to find one thoroughly documented in period photographs. 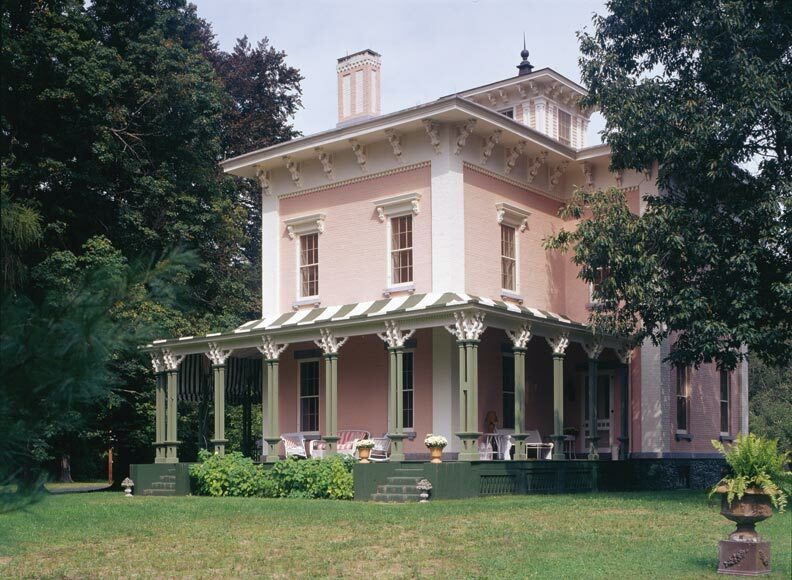 Yet that was just the case with this 1850s Italianate in New York’s Hudson Valley. Before the current owner purchased it in the 1980s, the home had largely remained in the hands of one family. Thought to be built by Richard Upjohn, the British-born architect known for designing countless churches and the grand Italianate Edward King House in Newport, Rhode Island, the house was originally constructed for a wealthy textile mill owner whose heirs held onto the property until the mid-1960s. 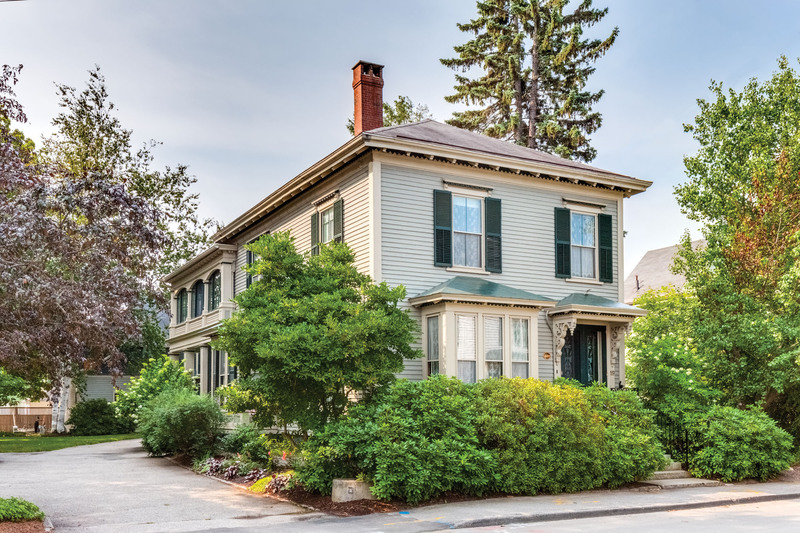 Given the owner’s background in architecture and the decorative arts, she knew she wanted to bring the house back to its original 1850s state as much as possible—all while updating the heating, cooling, plumbing, and electrical systems for the 21st century. The challenges of restoring such a grand house were aided by the original period photographs and documents, which were left in the house by the original owners. 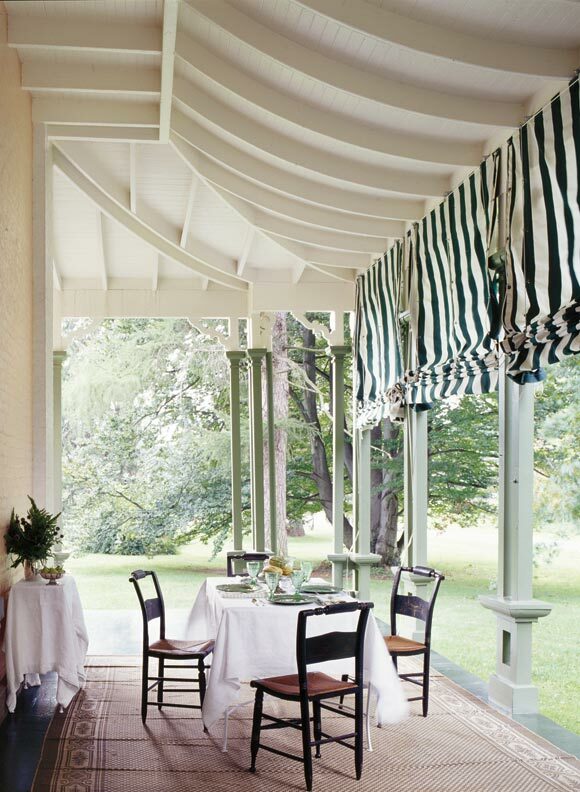 Striped shades on the back porch continue the theme of the metal roof overhead. Case in point: the cupola. It had been removed and roofed over sometime in the 1930s, but four structural posts remaining in the attic provided clues as to its dimensions, and 1860s photographs outlined its style. Kate blew up and analyzed the photos to create the design for its replacement, finishing it off with scaled-down versions of the eaves brackets lining the first and second stories. 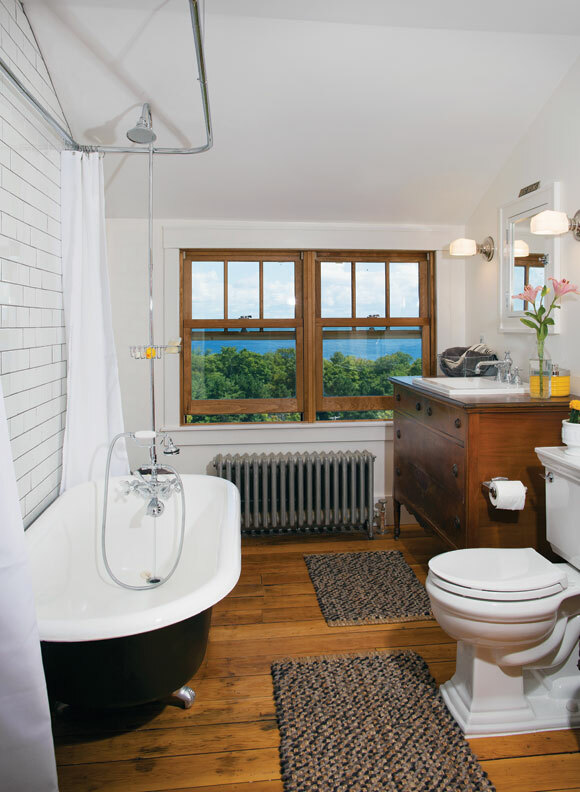 “Now it’s a finished room with wonderful views of the Catskills,” she says. Another of the house’s most distinctive elements—the striped metal roof topping the wraparound porch—was also present in the period photos. Though the black-and-white photographs gave little indication as to the roof’s color scheme, Kate surmised that the original intent had been to make it look like a tent awning, a fashionable treatment during the mid-19th-century Regency period. “We chose green and white as a very traditional striped tent color scheme that also happened to look beautiful with the pink house,” she says. The period photographs helped guide the restoration of interior details, too, particularly the two large mirrors sitting atop mantels on the first floor. The Renaissance Revival mirror in the living room had been painted with gold radiator paint, while the Eastlake-style one in the dining room had been given a coat of white house paint. Kate hired a master gilder to restore their original luster. 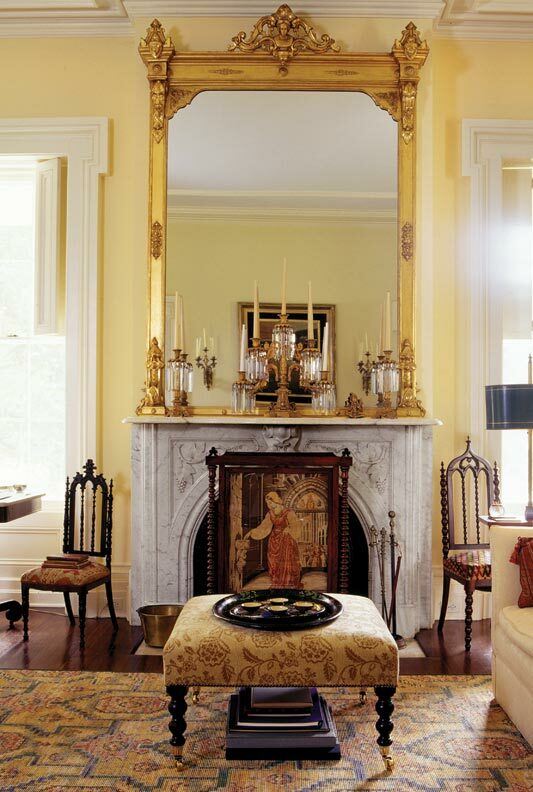 A restored Renaissance Revival mirror sits atop the marble fireplace in the living room. Other details, such as the bracketed hoods topping the windows on the front façade, revealed themselves through hands-on investigation. “We thought they were cast iron,” says Kate, “but when we started to remove the paint, we discovered that they were mahogany.” The strong hardwood had imbued the hoods with superior weather resistance; they needed nothing more than a fresh coat of paint. On the first floor of the house, removing the dropped ceiling revealed original plaster moldings, which had been slightly mangled during various renovations over the years. “Fortunately, we could see a lot of them intact, so we knew what we had to do to restore them,” Kate says. They used the untouched moldings to make templates, then filled in the damaged areas with new plaster. 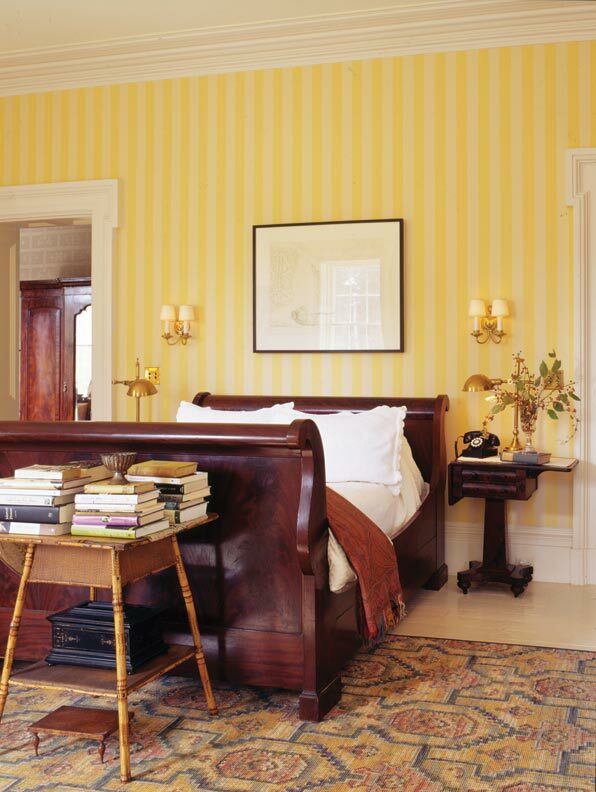 Pockets within the window wells throughout the first floor and in the major bedrooms indicated that interior shutters had been removed; Kate was able to re-create them, using the molding profiles of original doors throughout the house as models. 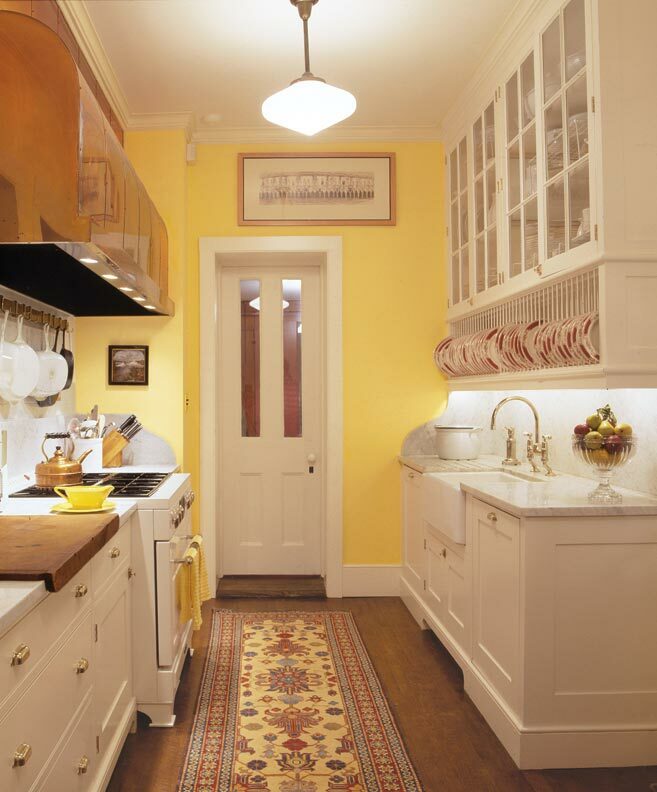 A vintage-looking stove, copper hood, and marble countertops contribute to the 1920s feel of the small galley kitchen. The laundry room, meanwhile, was born from a tangle of steel posts, failing beams, and abandoned wiring and pipes in the basement. Kate removed the rotting wood floor, which had been laid directly over dirt, and replaced it with colored concrete that mimics linoleum. She also designed banks of cabinets to provide ample storage in a house where closets are practically nonexistent. While the owner was happy to forgive the house’s lack of storage (“People didn’t have closets in the 1880s; they had armoires,” she explains, “so we got a couple of armoires”), she wasn’t as willing to overlook the outdated mechanical systems. The plumbing, electrical, and HVAC systems were upgraded to modern standards. To overcome the difficulty of running traditional ductwork through the super-solid brick walls, Kate installed a high-velocity small-duct HVAC system, placing air handlers in the basement and attic to deliver air through the floors to the first and second stories. 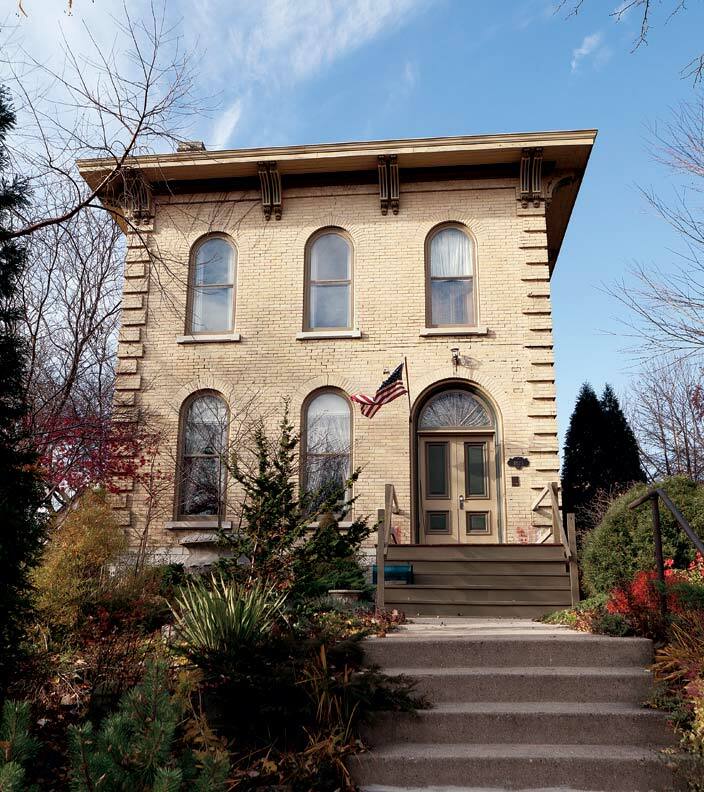 Top-notch restoration for an 1881 Italianate, inside and out! 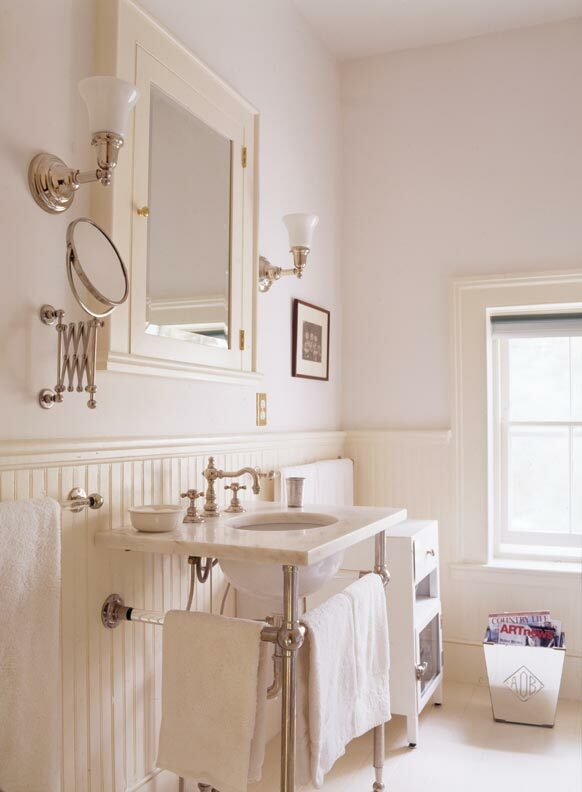 Respectful owners create comfortable rooms, a period-inspired kitchen—and even removed a boxcar addition.